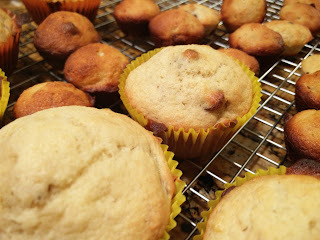 Nick and Alona Kitchen: Banana Nut Muffins ...with chocolate! Banana Nut Muffins ...with chocolate! We have made these muffins twice now. The first time we made them using just the base recipe. They turned out delicious. They do come out a little brown, but I think that is because of the amount of butter in them. It seems like a lot, but it is really worth it. 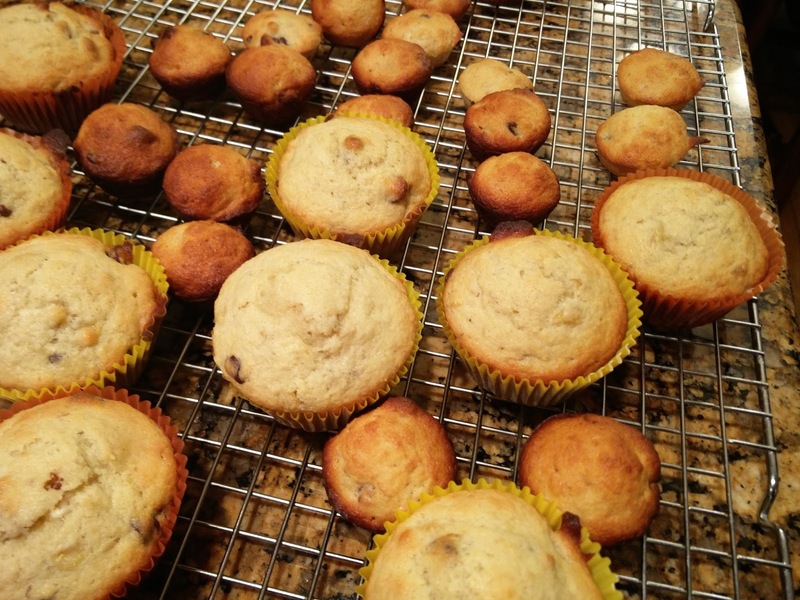 The second time we made them, we added chocolate chips - this made the muffins even better! From now on we will definitely do this modification more often! We also added a little bit of coconut flour (just for fun!) There didn't seem to be much taste difference, it seemed maybe a little sweeter. But, it could be a good mix in for those with dietary restrictions in regards to the amount of flour they can have. Wouldn't recommend substituting too much with the coconut flour, but a small amount turned out just fine. Also, we did not separate the banana to mush a part of it separately. We just put all of it into the stand mixer. 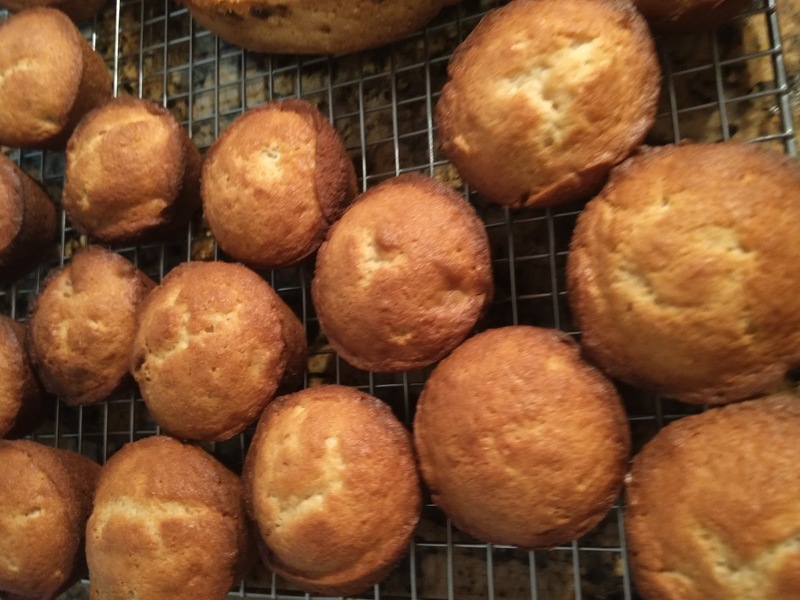 This seemed to work out fine and we still maintained texture in the muffins as we wanted. This recipe does seem to make more than the original recipe suggests...seems like all the muffin/cupcake recipes do! Not sure if it's because we are at altitude here or something else. We ended up making 36 mini muffins and 12 large muffins. 2. In a large bowl, combine the flour, baking soda, and salt; set aside. 3. Add the bananas to an stand mixer fitted with a wire whisk. Whip the bananas and sugar together until mixed. Add the melted butter, eggs, and vanilla and continue beating. 4. Mix in the dry ingredients just until incorporated. Remove from stand mixer. 5. Add in the nuts and chocolate chips. 6. Spoon the batter into the muffin tins to fill them about halfway. 7. Bake until a toothpick stuck in the muffins comes out clean about 20 minutes. 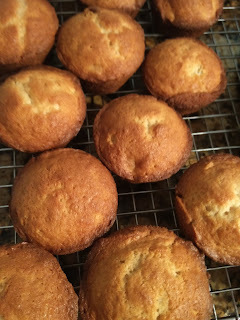 The mini-muffins will need less time - test with a toothpick. It should be 12-15 minutes for them. This is a great recipe. The muffins are really delicious especially with the chocolate chip additions! This recipe does feel like more work than others though. He loves the muffins. SO does Astrid! - especially the chocolate chips. It would be fun to add some sugar crystal sprinkles to the top of the muffins for prettyness.